plans have been unveiled for 125 greenwich street, an 88-story residential skyscraper that will rise above new york’s financial district. the tower is being designed by uruguayan architect rafael viñoly, while british design studio march & white is developing the building’s luxury interiors. 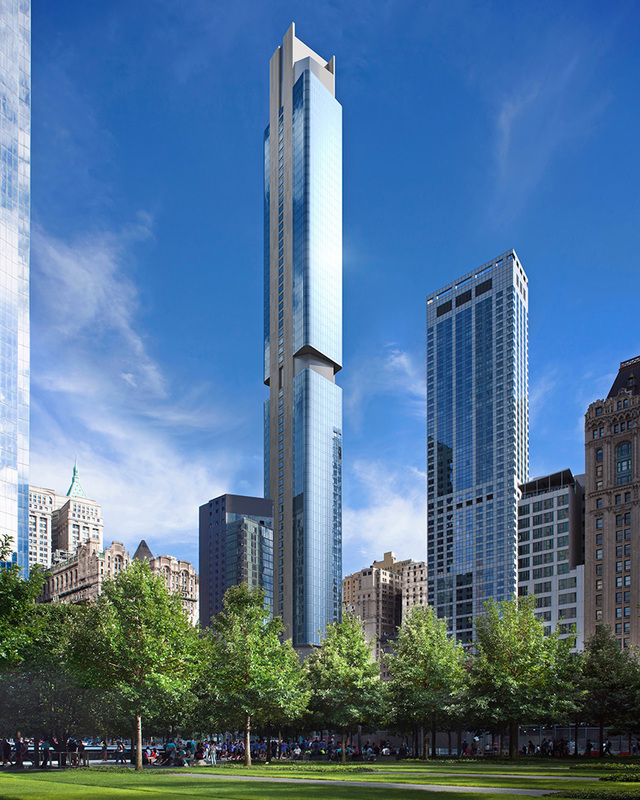 the project will be viñoly’s second manhattan skyscraper, having already completed 432 park avenue. 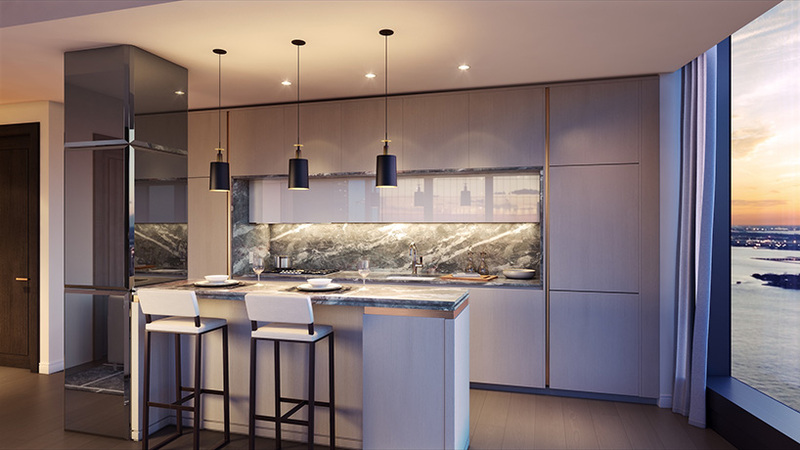 rising to a total height of 912 feet (278 meters), 125 greenwich street will contain 273 units ranging from studios to three-bedroom condominium residences. 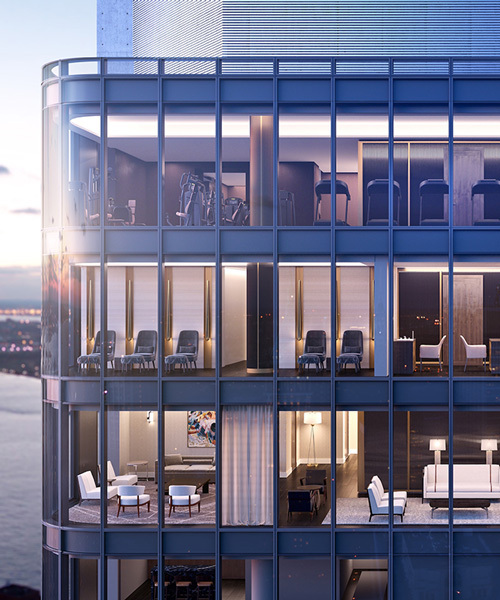 offering sweeping city views, the building’s top three floors will be dedicated to lifestyle and wellness amenities. facilities include a 50′ (15m) lap pool, a spa with a sauna and steam room, and a fitness center with a private training room and yoga studio. dining areas, as well as an events space and screening room, are also included. 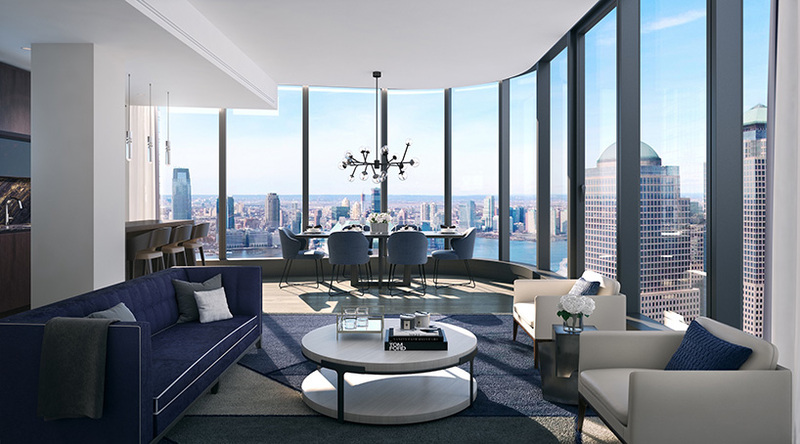 to learn more about 125 greenwich street, designboom spoke exclusively to davide bizzi of bizzi & partners development, the real estate firm behind the project, and elliot march and james white, founders of interior design studio march & white. read their thoughts, and see more images of the supertall skyscraper, below. designboom (DB): how did you respond to the scale of the project and the brief from bizzi & partners? march & white (M&W): our architectural approach to interiors allowed us to both conceptualize the project holistically and break down the scale of the building by considering each and every detail together, and how this all worked in unison to maintain a sense of consistency and design aesthetic from the lobby to the residential condos and amenity space. also, bringing our background in designing super-yachts to the residential apartments allowed us to hit the brief that bizzi & partners set which underpinned the project. DB: what kind of atmosphere did you want to establish within the homes? M&W: firstly, the base of the interiors is thoughtful and structured, this was very important to us from the outset. clever, well-designed space is what we wanted to bring to this project as we believe this is what our clients and the buyers demand from buildings of this stature. also of equal importance is to bring a sense of warmth through the materiality. this sensibility also stems from our work in designing luxury private members clubs around the world that we apply to residential design. no matter what the scale, we always place ourselves right there with or as the client to make sure that, whether it’s one home, several townhomes, or 200 units, the goal is to provide a sense of luxury and comfort. DB: can you talk a little about the units’ three interior finish palettes? M&W: we wanted to offer the buyers a range of different high-end materials and details that they could choose from in 3 pallets. the pallets were influenced by the color variation of the unique views that are apparent as you ascend the building. terra, which evokes the ground plane’s urbanity with warm and rich tones of green and brown; aqua, which recalls the blues and grays reflected off the hudson; and stratus, which reflects the clouds seen. in addition, customization and choice plays a role. we gave the buyers a choice of three different furniture packages that they could directly purchase from march & white. the ability to engage buyers and offer choice is important to us and it is in abundance in this project. DB: in what ways does your design respond to rafael viñoly’s design of the building itself? M&W: the architecture defines simplicity of form at the highest possible level. as architects as well as interior designers, we understood the complexity of such a proposition and ensured the interiors had an equal level of rigor whilst bringing warmth and luxury through our choice of materials and attention to detail. the interiors also play off the views that are framed by the architecture. it was important to never allow both to directly compete, more to work in the beauty of unison and harmony. DB: what does luxury interior design mean to you? 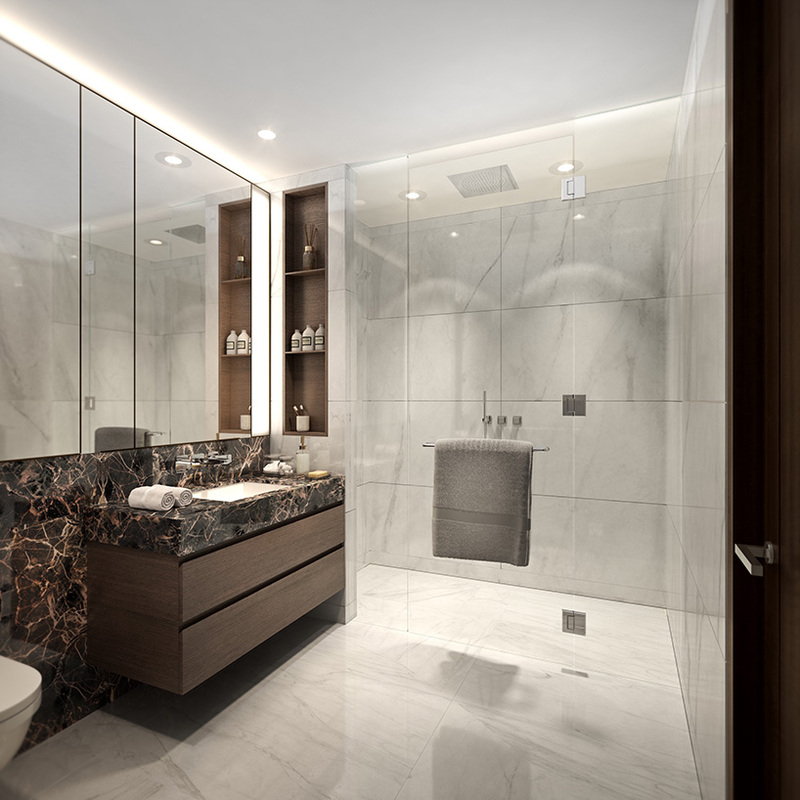 in what ways are you able to convey a sense of luxury with a project such as this one? M&W: luxury to us is all-encompassing. it is never one element alone, it permeates everything we design. materiality that provides warmth, details that are inspired from yachting, to the way people relax and socialize in members clubs that we can apply to the design of amenity spaces, all work together. davide bizzi is the chief executive officer of bizzi & partners development, a global real estate development firm he founded in 2000. in the US, bizzi & partners is currently working with italian architect renzo piano on 565 broome soho in new york, and eighty seven park, a residential building in miami beach. designboom (DB): you are currently working on a number of developments in new york, and the americas in general. 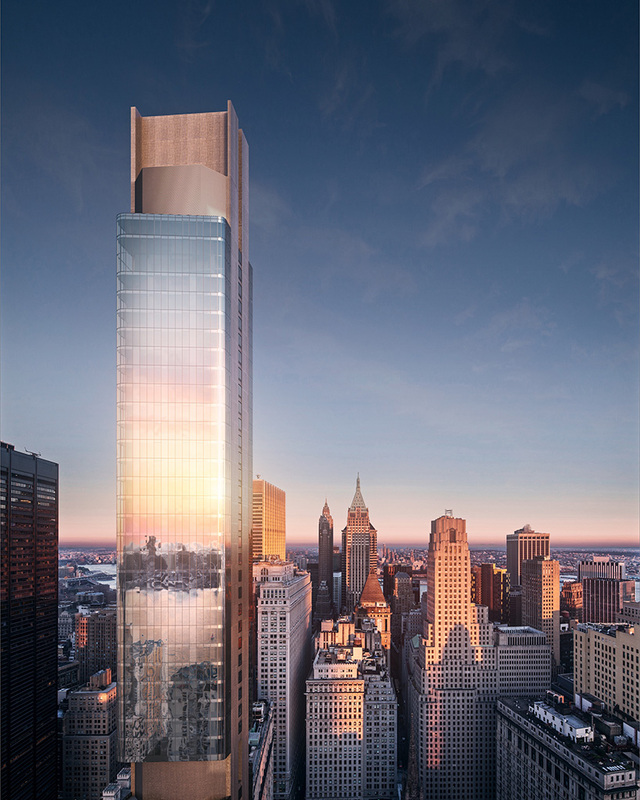 what makes 125 greenwich street unique? davide bizzi: 125 greenwich street is the new paradigm for downtown new york living. the collaboration between rafael viñoly and march & white is a lesson in exceptional craftsmanship, attention to detail, and artful design. luxurious amenities like the yoga studio, lap pool, and spa on the top three floors of the building produce an exclusive private club experience. all of this will offer residents a distinct cosmopolitan lifestyle that can only be found in new york. DB: how closely did you work with rafael viñoly on the building’s design? what brief did you give him for the project? davide bizzi: we worked closely with viñoly to conceptualize the building. given the location’s incredible views of the city and harbor, we knew early on we wanted a glass tower that would put the views on display. we were drawn to viñoly thanks to his beautiful work at a tower in midtown manhattan, but we also wanted to give him the creative freedom to leave his mark on the new downtown. DB: similarly, what was the brief for march & white? what type of interiors and atmosphere did you want the team to create? davide bizzi: march & white is known for designing intimate spaces, particularly private clubs and yachts, with impeccable details that elevate a room. they also understand how to maximize a space, which is incredibly important in a city like new york where space is limited. the result is a high-end, yacht-like interior unlike anything currently available in new york. 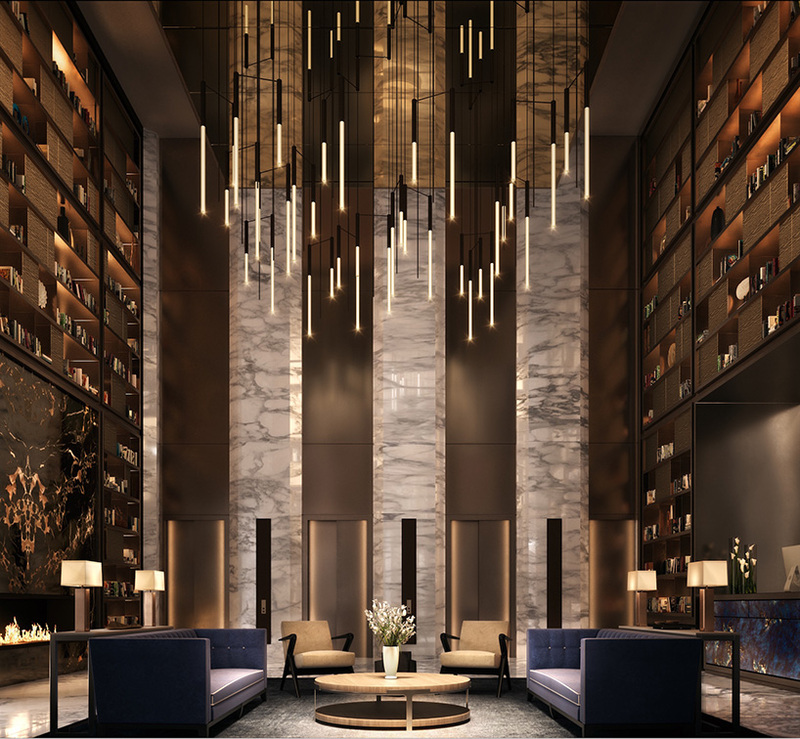 DB: what amenities can we expect at 125 greenwich street? how important was it to position them at the top of the building? davide bizzi: locating the amenities at the top of the building is unexpected; typically, they’re located on the lower floors, sometimes even in the basement, with top-floor views reserved for one or two select owners. by moving the amenities to the top, we created a more inclusive and inviting space for the residents. where else can you swim in a 50′ lap pool, host a dinner party, or do yoga while admiring views of the hudson river and the city at dusk?